Ordinary Seaman J/38447 William Chivers, Royal Navy, HMS Vehement. William attended Speenhamland School where he would have learnt the basic skills of reading, writing and arithmetic. After leaving school aged 13 he found employment as a factory labourer. The nearest factory to his home and one of Newbury’s biggest employers was Elliott’s of Newbury, a manufacturer of timber-based products, perhaps he worked there? In early 1915 William joined the Royal Navy as a ‘Boy 2nd Class’, a rating available to boys aged 15 to 17. On 15 September 1915 he was promoted to Boy 1st Class. In effect he was serving an apprenticeship with a view to joining the Navy as a seaman when old enough. This he did on his 18th birthday, 9 January 1917; he was 5ft 4in tall with a fresh complexion, brown hair and eyes. On 15 October 1917 William was posted to a brand new destroyer, HMS Vehement; the ship was so new that she had not yet joined an operational flotilla. In February 1918 Vehement was assigned to the 20th Destroyer Flotilla operating out of Harwich. In 1918, the 20th Destroyer Flotilla was engaged in a major British effort to lay minefields in the North Sea to close the Heligoland Bight to passage by German ships and submarines. On 31 May 1918, Vehement put to sea from Immingham with the flotilla to lay mines in the Dogger Bank area. On the night of 4-5 June 1918, the flotilla again deployed from the Humber estuary to mine the same area, bringing the total number of mines laid in the two expeditions to 330. Vehement's next sortie from Immingham on 21 June 1918 ended almost as soon as it began when her propellers suffered damage after striking a cable while she was leaving the harbour, forcing her to remain in port for repairs. She was back in service in time to join her flotilla in laying a North Sea minefield on 27 June 1918. On the night of 5-6 July and again on the night of 8-9 July 1918, she joined her flotilla in laying a field of 384 mines in 18 rows in the North Sea. 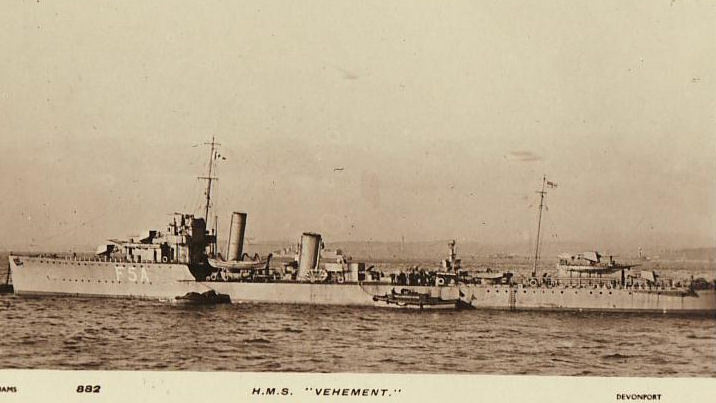 On the night of 13-14 July 1918, Vehement and the destroyers HMS Telemachus, HMS Vanquisher, and HMS Venturous laid a field of 224 mines in the North Sea. On the night of 17-18 July 1918, her flotilla laid another North Sea minefield of 424 mines with cover for the operation provided by the 7th Cruiser Squadron, but German forces did not interfere. Vehement's next minelaying operation on 24 July 1918 involved the entire flotilla laying 496 mines in the North Sea in 22 rows; during the operation, Vehement detected two periscopes. The flotilla sortied from the Humber again at 13:00 hours on 28 July 1918 and during the night of 28-29 July laid a North Sea field of 416 mines in 18 rows. On 1 August 1918, the 20th Destroyer Flotilla departed the Humber to lay a minefield in the North Sea at the seaward end of one of the German-swept channels through the German minefield in the Heligoland Bight. At 23:47 hours the force was within 20 nautical miles (37 km) of the area it was to mine when Vehement struck a mine at 55°33′00″N 005°24′00″E. Its explosion caused her forward ammunition magazine to detonate, blowing off the entire forward section of the ship forward of the forward funnel, killing one officer and 47 ratings .As the force manoeuvered to clear the German minefield it had entered, the destroyer HMS Ariel also struck a mine at 00:10 hours on 2 August and, in a repeat of what had happened to Vehement, suffered a magazine detonation that blew off the entire section of the ship forward of the whaleboat's davit. Ariel sank at about 01:00 hours, with the loss of four officers and 45 ratings, but Vehement remained afloat, and her crew had put out all of her fires by about an hour after she struck the mine. She was taken in tow by the destroyer HMS Abdiel in the hope of saving her, but at 04:00 hours on 2 August Vehement's stern rose into the air, making further towing impossible. Vehement's surviving crew opened all of her hull valves to speed her sinking and abandoned ship. Telemachus and Vanquisher then sank Vehement with gunfire. Sadly William Chivers was one of the unfortunate ratings killed on Vehement that night. Able-bodied Seaman William Chivers, son of Mr and Mrs Harry Chivers, Park-lane, lost his life by the mining of a destroyer on August 2nd. He had been four years in the Navy, which he joined on the outbreak of war. He was formerly employed at Thatcham Paper Mills, and was educated at Speenhamland School. Fred, another son, has served in the Navy five and a half years. His body was never recovered; his grave is the wreck of the Vehement. His name is remembered on panel 27 of the Plymouth Naval Memorial. Locally William is remembered on tablet 3 of the Newbury Town War Memorial and the Speenhamland Shrine (formerly in St Mary’s, Speenhamland, but now in St Nicolas’, Newbury). His name was also recorded on the long-lost memorial board from Speenhamland School.